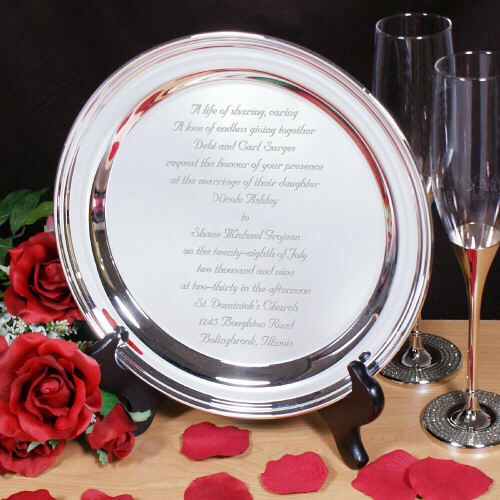 If you are looking for a special lasting memory from your wedding day our beautifully Engraved Wedding Invitation Plate Keepsake is the perfect gift. This Personalized Wedding Invitation Silver Plate will capture your beautiful invitation that made your wedding day so special. This is a great gift for any happy couple that has recently had a wedding or even an upcoming anniversary gift. Your Engraved Wedding Invitation Plate Keepsake measures 10" wide. Each plate is silver-plated for optimum representation and lasting beauty. Easel stand sold separately. Includes FREE Personalization. Personalize your Invitation Plate with the wording from your wedding invitation. Verify Wedding Text Yes! Personalization Is Correct. Additional Details Personalized Wedding Gifts from GiftsForYouNow.com are wonderful wedding gifts the bride and groom will enjoy for years to come. We specialize in fine quality wedding gifts. Each is personalized for the happy couple. We feature affordable, Personalized Wedding Gifts for every budget and special event.